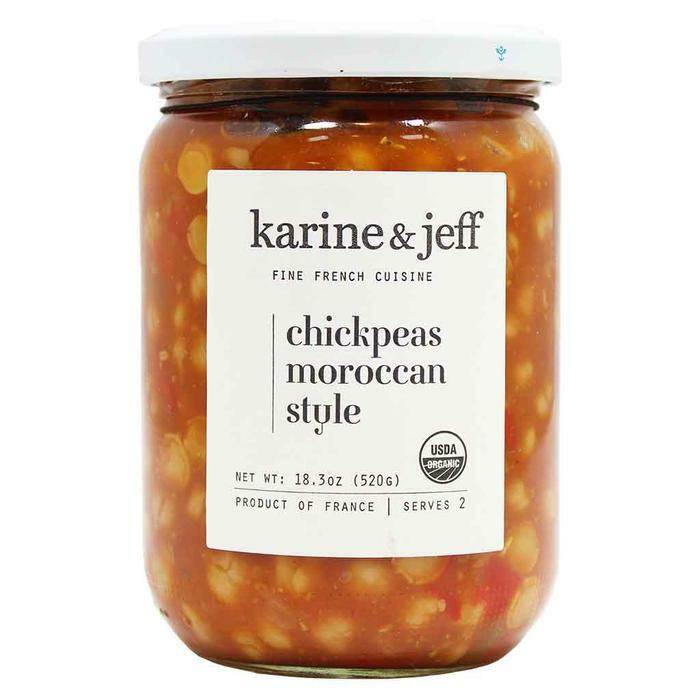 Karine & Jeff Organic Chickpeas Moroccan Style 18.3 oz. Karine & Jeff have outdone themselves with Chickpeas Moroccan Style. Made with Moroccan flavors, these Chickpeas are in a mild tomato sauce flavored bell peppers, dates, and cumin. This jar serves two people, serve hot over steamed rice or with a cucumber salad. These can also be used as an appetizer at your next party; all you need to do is heat up in a bowl and serve with toothpicks! Ingredients: Tomatoes*, Chickpeas* (37%), Red and green bell peppers*, Dates*, Extra virgin cold pressed sunflower oil*, Unrefined sea salt, Cumin*.